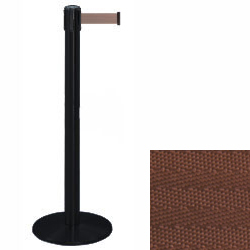 This stanchion w/ brown belt for crowd control has a 13.5"d base that keeps the system stable in high-traffic areas. The barrier system weighs 24 lbs. and as a result, is easy to move around. 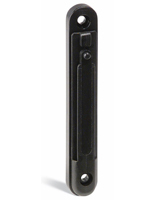 This stanchion w/ brown belt that is 2" wide is retractable to 7.5 feet. For best performance, place each queueing post and satin rope system no more than 7' apart. Buy compatible stanchions w/ brown belt from the Tensabarrier line to ensure all the supplies fit together cohesively. For higher traffic areas, we recommend Dual Belt Posts. To learn more about layout options, click designing crowd control systems.